When Dragons Fly ©2017 - I started this piece with the stone pool from an abandoned property in Scotch Plains, NJ. The house had already been demolished but the pool intrigued me with it's curious door shaped opening on one side that didn't seem to lead anywhere. It was surrounded by brush and debris so I placed it on the side of a sloping, stone hill I captured at Leonard J. Buck Gardens in Far Hills NJ with lovely plants growing along the top. The tree behind it came from another area of the gardens, but I loved the dripping leaves so I added it to the background and some clusters of ferns to the foreground. The little fish peering out of the water actually resides in an aquarium at my local pet store. The lady in sapphire blue (from my vintage photo collection) seems to be enjoying an afternoon stroll with her crow sporting his own blue fedora. 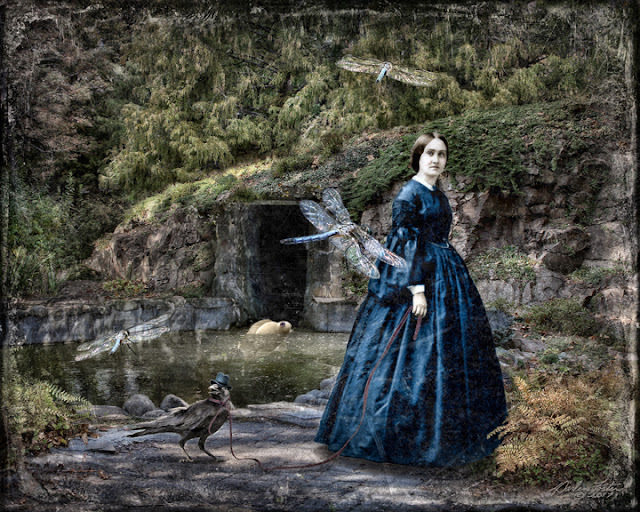 Lastly, I added the magical dragonflies which were living on the same property with the pool. The sun that day created such ethereal sparkles of light on their wings, reinforcing a supposed connection with nature's spirit and fairy realms. It's hard to believe after hatching from an egg, this enchanting insect lives most of it's life as a brown, rather nondescript nymph under water for several years. When ready to metamorphose into an adult, it climbs to the surface at night on an emerging plant. When it's system adapts to breathing air, the skin splits open and the adult dragonfly climbs out. It spends the remainder of the night drying out and plumping up it's wings before, at sunrise, taking flight as the beautiful, agile creature we know as the dragonfly!